My knowledge of geography is terrible. On a good day, I can tell you where half of the 50 states are located, but if you move outside the U.S., it gets really bad. Geography is a subject I’m trying to learn along with my kids as we’re homeschooling. Here are some ideas that I think might help reinforce what we’re learning. Where in the world is that? This is a game you can make up about any aspect of geography. Choose a state, cities in a state, continents, countries, or even famous landmarks or geographical features about which you wish to learn. Make a list of clues about different places in your subject area and have participants take turns guessing until someone gets the right answer. You can award points and see which person/team answers the most questions correctly. Put a map on the wall. 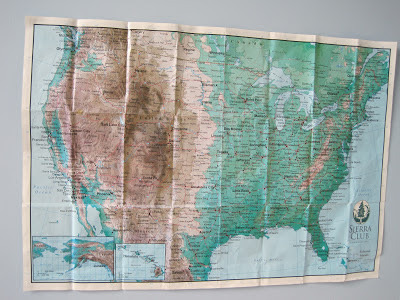 We have a map of the United States taped on the playroom wall (which is where our girls do their schoolwork). As we plan trips, we trace our route. When we meet new people or read about someone who lives in America, we can easily see where they live. Place a globe in an accessible location. Our younger daughter was fascinated with globes for awhile. We don’t currently have one (as two have been broken over the years), but need to bring one back into our home. If your church supports missionaries, study the country, culture, and customs where the families are located. Correspond with them via mail or e-mail if possible and learn about their ministry with the local people. Choose one country per month to study. At the library, check out age-appropriate non-fiction books about that country. If you can find a fictional story set in that country, that can really add to the lesson as well. We have done this during the summer months and I’ve had our girls help cook a few foods that would be native to the country we are studying. Find facts about a particular country or region on the Internet and make up a story about a child who would be the same age as your child. Build on the story a little bit each day and incorporate interesting facts about the food, celebrations, and schooling of the children in that area. How well do you know your geography? Do you have any other ideas for improving geography skills? Hanging maps on the wall is a great idea! Maybe our new house will have a schoolroom where we can do that. Our co-op Classical Conversations has my kids learning geography. Because I have to teach them, I'm learning it, too. It's neat when they hear China mentioned, and they know where it is on the map.